I can't actually believe I've had a conversation today about my plans for the October half term holiday - I mean, I know I'm on maternity leave now but it really seems as though the summer holidays have only just been and gone. Surely it can't be time to be making plans for the next school holidays yet..? Time really does fly doesn't it. So anyway, as I'm talking "making plans" where is it we'll be taking a trip to during these said holidays then? 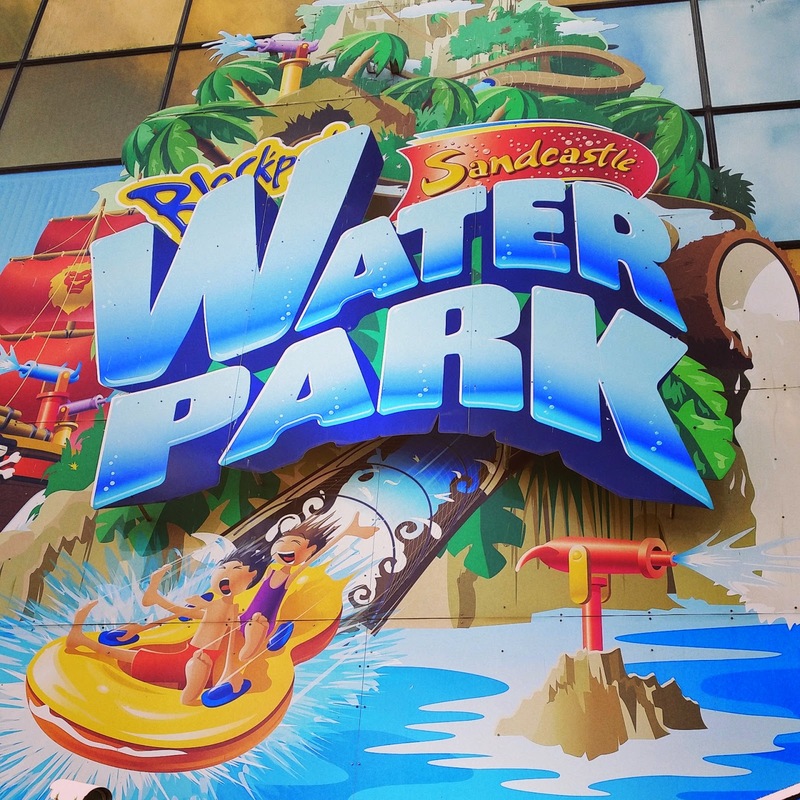 Well, we know for certain that we will be heading back to the Sandcastle Waterpark in Blackpool. It was brilliant and lucky for us, we also had an opportunity to visit again during this years six week holidays too, but it was just the three of us this time, and it was so much fun - I can definitely see it becoming one of our regular family holiday outings. My nine year old blooming loves the place. The visit this year was a little different for me though - last time I was on all of the rides, was in and out of the water - it was amazing - but through a combination of having a Baby Baker filled tum and feeling a tad unwell, I didn't actually get in the water on our most recent trip. But it did mean that I had an opportunity to have a delve into the different aspects of the Sandcastle that I didn't even entertain last time around. 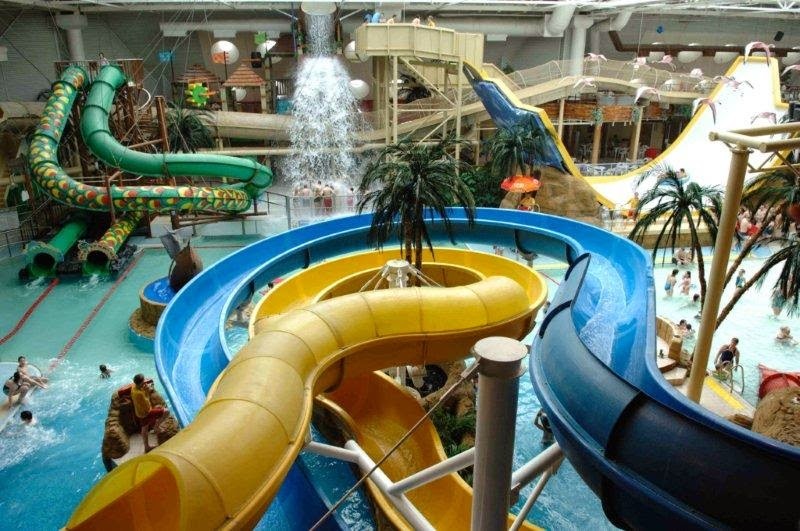 Now taking photographs inside of the pool is a really difficult task - and as it should be too - for safeguarding reasons. Lifeguards constantly challenge you if they spot you with a camera or electronic device on the pool side and as much as this hindered me being able to photograph the slides or the resturants, in a situation like this, with children and swimwear clad people all over, I think it is brilliant. You really can never be too careful - which is why this post is photo lacking I'm afraid. Anyway, as we entered the Sandcastle it was clear to see that half of Blackpool's population had decided to head there that day too - it was jam-packed - but fortunately for us, we were allowed to pop in first and managed to avoid the wait. And so the boys headed to the pool, myself to find a spot, pool-side, to sit myself down for the day. Once I was seated I was soon approached by a lifeguard who asked if I could possibly move seats as I wasn't allowed in the area I had parked myself (typical!) but then upon seeing my rather large, pregnant state he suggested I would be better sitting upstairs anyway as it was quite close to the exit so I could escape if it became too hot for me to cope with. So that's what I did - I moved and I sat - and for a while I read a magazine and then attempted a few blog posts - although the wifi wasn't being my friend I must say - but then before too long, that horrid humidity really did get the better of me - I just couldn't stand it any longer. So the boys came back, thinking of their stomachs as usual and ordered lunch from one of the snack bars whilst I popped outside for a little fresh air - the staff on reception were very understanding and stamped my hand so I could enter and leave as often as I needed to. He didn't stop grinning the whole way through and couldn't wait to eat so he could get himself back into the water. 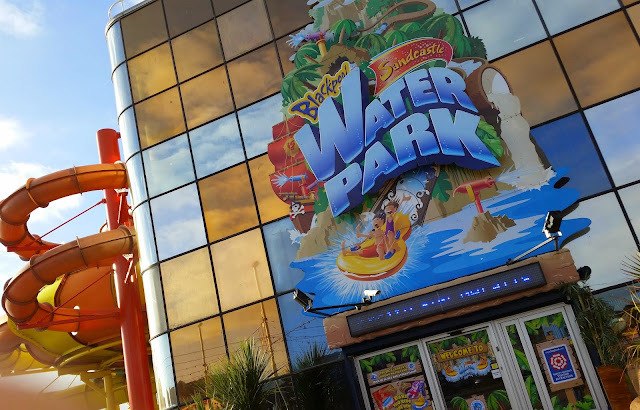 And that's exactly what they did - retreated back into the pool as soon as they possibly could, so I decided that I would go and take in a few of Blackpool's sights and I went to sit outside of the waterpark for a while. It was actually really nice and peaceful...well, as peaceful as Blackpool can be...and I think I must have just sat, relaxing, for well over an hour - staff members kept popping out for their breaks themselves and were really friendly and chatty which was a lovely touch. Service was fast and I plonked myself down, watching the world go by. Now even at this point in the day, the queue of people still wanting to get into the pool was long and hectic and there were more than a few restless young kiddies stood about. Naturally staff were used to this and I watched how they walked up and down the line with jugs of juice and cups in hand, offering them - free of charge - to people who were waiting, obviously making sure everyone stayed as hydrated as possible. What a fab thing to do. And so, whilst I may not have experienced the water this time around I still had a brilliant time and was able to witness a whole lot of helpful, friendly staff members and consume some really nice refreshments. *tickets provided free of charge - thoughts, words all my own, as are pictures unless stated. This looks and sounds similar to a place up here called Wet n Wild, but like way better! ( and way cleaner I assume lol). It is fab that it was hard for you to be allowed to take photos, especially as a mother that must make you feel better especially with there being so many waterproof and small devices that people can get these days. That's so cool that they offered juice to those waiting too - love places that actually care about their customers!